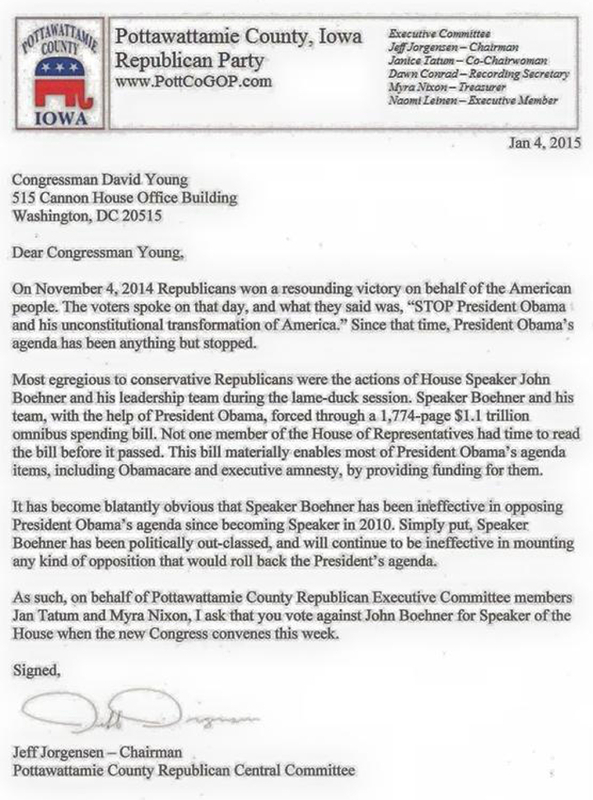 In a sternly worded letter drafted Sunday, the Pottawattamie County Republican Executive Committee instructed Congressman-elect David Young to vote against U.S. Speaker of the House John Boehner when the new Congress convenes this week. In the letter, which can be seen at left (click to see it in full size), County Chairman Jeff Jorgensen said he was writing on behalf of the County Executive Committee, which includes Co-Chairwoman Jan Tatum and Treasurer Myra Nixon. The letter is noteworthy because Pottawattamie County is the second-largest county in terms of population, behind only Polk County, in the Third Congressional District, which Young will soon represent. According to the Iowa Secretary of State’s Office, Pottawattamie County has the second largest number of active Republican voters. Jorgensen noted that voters at the Nov. 4 General Election had soundly rejected President Obama’s agenda, but that Congress had done nothing to stop it during the lame-duck session that followed the election. Most notably, the House – with a Republican majority – passed the nearly 1,800-page, $1.1 trillion omnibus spending bill during the post-election session. Last weekend, Rep. Louie Gohmert (R-TX 1) announced he would stand for the speakership when the vote takes place Tuesday, Jan. 6. Rep. Ted Yoho (R-FL 3) also announced he would stand for the GOP’s top leadership position in Congress. Both men have solid conservative credentials, prompting Rep. Jim Bridenstine (R-OK 1) to announce he could support either for Speaker, but that he would not support Boehner. A split vote will not harm Republicans’ ability to retain the speakership; the Speaker of the House must be approved by a majority of the voting members of the House of Representatives. It will likely take several ballots to reach a consensus on the speakership. But, the effort to remove Boehner has only grown momentum since Congress ended the lame-duck session. Over the weekend, FreedomWorks became the first of the major conservative organizations to support the effort to oust the Speaker. “With a growing Republican majority in the House and a historically high number of liberty-voting fiscal conservatives within it, there is an urgent need replace Speaker Boehner with fresh, bold leadership that better represents the views of the whole caucus. 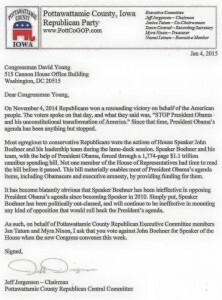 “Speaker Boehner has kicked fiscal conservatives off committee positions for voting against his wishes, caved on numerous massive spending bills at the eleventh hour, and abused the legislative process to stomp out opposition by holding surprise votes and giving members little time to actually read the bills before they vote. Rep. Steve King (R-IA 4) has not yet indicated how he will vote, but the relationship between him and Boehner has always been frosty, at best. Congressman-elect Rod Blum (R-IA 1) also has remained silent on the speakership vote, but has fielded a number of calls to support the effort to oust Boehner. The Speaker has not yet responded to the announced challenges to his leadership. 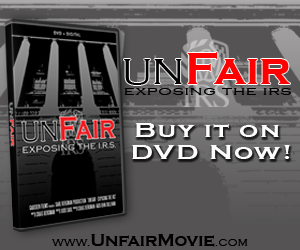 To learn more about Gohmert on the issues, click here. To learn more about Yoho on the issues, click here.